With a new school year under way, it’s a good time to reflect on the state of school nutrition. As childhood obesity and diabetes rates continue to climb, it’s never been more important to address kids’ dietary habits. Chef Ann Cooper: Also known as the “Renegade Lunch Lady,” Cooper is a chef, nutrition services director, consultant, author, public speaker, and advocate for school nutrition. In 2009, she founded the Food Family Farming Foundation to further the cause of improving school nutrition. Some of the foundation’s current projects are The Lunch Box, an online tool kit of healthy and delicious school food solutions, and Let’s Move Salad Bars to Schools, an initiative to significantly increase the number of salad bars in schools across the country that was started in support of First Lady Michelle Obama’s Let’s Move! campaign. David L. Katz, MD, MPH, FACPM, FACP: Katz is founder and president of the Turn the Tide Foundation, an organization dedicated to developing and evaluating creative, practical strategies for empowering individuals and families to achieve optimal nutrition, good health, and sustainable weight control as well as lowering the rates of obesity and chronic disease among children and adults. Katz has developed numerous educational nutrition and fitness programs for schools that cost little or no money, including ABC for Fitness and Nutrition Detectives. He’s also one of the lead developers of the NuVal nutritional scoring system, which lists the nutrient content of more than 100,000 foods, and the PHINDER database, a clearinghouse of promising and best practices for health promotion in various settings. Pamela Koch, EdD, RD: Koch is executive director of the Center for Food & Environment at Teachers College, Columbia University. Her main research focus is on evaluating the impact of educational interventions on eating behaviors. She’s the primary author of the Linking Food and the Environment (LiFE) curriculum series as well as an active volunteer in the nutrition program of her children’s elementary school. She’s also a frequent presenter at National Science Teachers Association and Society for Nutrition Education meetings. Marion Nestle, PhD, MPH: Nestle is the Paulette Goddard Professor in the department of nutrition, food studies, and public health as well as a professor of sociology at New York University. She was a senior policy advisor for Health and Human Services from 1986 to 1988 and managing editor of the 1988 Surgeon General’s Report on Nutrition and Health. In addition, she’s written several books, including Food Politics: How the Food Industry Influences Nutrition and Health and What to Eat as well as a monthly “Food Matters” column for the San Francisco Chronicle. She blogs at www.foodpolitics.com. Ilaria St. Florian, MS, RD: St. Florian is a clinical dietitian at Stamford Hospital in Connecticut as well as a health and nutrition writer. She’s written curriculum for and helped implement nutrition programs in the New York City area, including Foodfight, a two-part program for high school students that not only focuses on nutrition education but also teaches media literacy to help students identify the ways that advertisers influence their food choices. TD: What are your thoughts on the current nutrition landscape in schools? Katz: I think the trends are generally favorable. Much attention is being paid to this issue. There’s plenty of grassroots innovation. Frankly, I believe, to some extent, a rising tide is lifting all boats as schools that aren’t attempting to do something to improve nutrition are embarrassed by actions that are occurring in other districts. Obviously, resource availability differs. Some schools have more money, more talent, and are better able to do this, but it’s really rare to find school districts that are inattentive to the issue. That’s a change. And the idea that nutrition matters to schools is a concept that has been widely embraced. And then there are the many good innovations being done locally that are providing better salad bar selections and more fresh produce. Schools are entering into relationships with farmers’ markets, working to establish an edible schoolyard or, eventually, creating some sort of link with a community garden. Along with that, we have federal initiatives to raise the standards of the quality of nutrition in schools. And we have clever intervention programs, such as the work of Brian Wansink [author of Mindless Eating], which has the added advantage of potentially improving the selection kids make in the cafeteria at virtually no cost. These are minor tweaks of the arrangement of items in the cafeteria. When you add all this together, it really starts to matter. Nestle: We could be doing much better. Kids should be eating foods, not nutrients. TD: Does the child nutrition bill, which President Obama signed in 2010, give you a reason to be optimistic about the future of school nutrition? Cooper: Yes. I think the bill potentially could make things better than they’ve been. And I say potentially because, even though the president signed the bill, we don’t know what implementation is going to look like, how long implementation is going to take, and how it’s all going to get paid for. [In May], the [House of Representatives] Appropriations Committee suggested that Food and Nutrition Services rewrite the bill that President Obama signed because they felt it was going to cost too much money. Koch: The reimbursement rate went up some so I think that’s good, and it’s also trying to mandate for more funding that would provide for nutrition education in schools, which I believe is very positive. Given what the general economic environment is, it’s positive that people are saying this matters. Nestle: It depends on how it’s implemented, and that depends on who’s in the schools. TD: What’s the most encouraging thing going on in school nutrition these days? Cooper: I guess it’s that people are feeling like change is important. I wouldn’t say it’s a groundswell, but I believe many people are talking about school food in a different fashion. The Institute of Medicine guidelines will go a long way to making food better, and people are starting to understand that the food we’re feeding our kids has been making them sick. 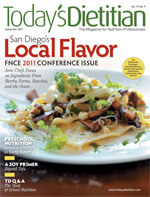 Koch: The most encouraging thing is children are getting more opportunities to have experiences with real, whole foods. More schools are educating children about food and understanding our whole food system is an important part of the curriculum and can be integrated into academic subject areas, most notably science, math, and other subjects. The recognition of learning about food as being an integral part of the curriculum is important. Nestle: The food movement! The push to give kids real foods and teach them where food comes from and how to cook it. St. Florian: Programs in the curriculum should be taught to children in a way that’s engaging and interactive and puts the responsibility on the individuals. Children tend to be self-absorbed, and they want to know, “Hey, what is this going to do for me now?” If you can answer that question, it’s going to make a bigger impact than if you say, “OK, if you eat your vegetables now, you’re going to reduce your chance of developing cancer in the future” because that doesn’t mean anything to a child. What is the impact here and now? TD: Where should other efforts be focused? Katz: This is one of the many instances where it’s important for epidemiology to trump ideology. So we’ve got to look at which dietary patterns are most associated with the better health outcomes. Why not have a few good evidence-based dietary patterns that schools get to choose from? But limit it to that. We could systematically improve the engineering of the dietary patterns in schools. The goal shouldn’t be “better”; The goal should be “optimal.” There’s certainly room for debate about variations on the theme of optimal, but what’s important is the theme. There’s a theme: close to nature, mostly plants. We do know what the theme is, what the most healthful foods are. So that should be the goal. Nestle: Efforts should be focused on food-based standards for school meals but mostly on universal school meals. That alone would make a huge difference and save money too. TD: Are there any success stories you’d like to share? Katz: The work of Christina Economos at Tufts [University]. The Shape Up Somerville [Mass.] program wasn’t limited to schools, but schools were part of it, and it provided evidence that a whole community could improve its waistline. A program run by Mehmet Oz called HealthCorps is sending health coordinators, who are typically recent college graduates, to high schools around the country. Alice Waters’ work: There’s some real traction there. More schools are interested in Edible Schoolyards and, certainly, where climate permits, there’s much more going on there. Tim Cipriano of the New Haven [Conn.] school district has national recognition for his innovations with the menu there. They’re practicing Meatless Mondays, so he’s introducing vegetarian options into the schools. There’s a program in Colorado called Our Kids, Our Schools. A mom activist started the program. When the food standards of the school aren’t everything they should be, she’s created an opportunity for parents to go online and order high-quality lunches that meet high nutrition standards and that are packaged at the local Whole Foods and then delivered. Koch: One success story involves the elementary school where my children attend and where I work on wellness with fellow parent and chef Ellie Krieger. At the Halloween party last year, for a low additional price, the kids had the option of choosing cantaloupe, cherry tomatoes, grapes, or baby carrots as side dishes during their meals in addition to sweets. We also had a tasting of three different New York apples that were free and butternut squash that had been roasted with a little bit of maple syrup. These fresh foods were the first foods they saw when they came in so they actually were eating those vegetables and fruits first. TD: In an ideal world, what are the reforms you’d like to see take place right now in schools across the country? Cooper: Once we replace highly processed foods and start serving kids fresh fruits, fresh vegetables, whole grains, healthy proteins, cooked-from-scratch food purchased with a priority in local procurement, that would be huge. In addition, there should be a salad bar in every school in our country. That would be a great start to helping kids eat healthier. Katz: I would establish a meal plan incorporating variations on the theme of best diet and design the offerings in school cafeterias around that. I would provide laminated cards in front of all the great recipes being produced in schools so the kids can take them home, and mom and dad, who might not know how to cook, would learn how to cook because of what their kids are eating in the schools. I would have chefs from the Culinary Institute of America do internships in schools around the country. We need a national adopt-a-school program the way we have a national adopt-a-highway program so resource limitations aren’t problematic. Furthermore, there needs to be complementary programming at worksites and schools so parents get the same message. Ideally, we would fix the farm bill as well so the more nutritious foods wouldn’t cost more, either by changing the government subsidies or by doing a financial incentive program at the point of purchase. And this is a focus on the nutrition side. I would do all of the same kinds of things on the physical activity side. TD: What obstacles are standing in the way of change? Cooper: There are five big issues: food, finance, facilities, human resources, and marketing. Food: Where are you going to get it and make sure it’s good? Finances: How do you pay for it? Facilities: What do you do if you don’t have a stove or a walk-in freezer? Human resources: How do you get everybody trained? And, finally, marketing: How do you get the kids to eat it? So there are several challenges. They can all be overcome, but they are many. Katz: The status quo is difficult to revise because, basically, whoever’s profiting from the way things are now has more money than people who would profit from the way things could be. And whoever’s got the most money now has the most influence. So there are huge forces in the way. Every aspect of agribusiness opposes the changes we need to make healthy eating the norm. The good news is there’s money to be made doing the right thing as well. Koch: One of the biggest obstacles standing in the way of change to school lunches is the reimbursement rate that schools get for meals. The foodservice directors, by and large, are doing the best they can given the situation they’re in. In terms of education, the biggest challenge is that there’s so much focus on standard-based education, and we have teaching geared toward the standardized tests that students must take. And even though we develop nutrition curriculum that incorporates the standards, schools are so pushed toward a specific curriculum that meets every standard across the board, that it can be hard to include nutrition education. St. Florian: Funding to implement in-school nutrition programs and improve the quality of food served in the cafeteria. It doesn’t necessarily have to cost more in the long term, but, in the short term, it will require changing how things operate on a daily basis. In addition, no matter how well kids eat at school, they must eat healthfully at home too. In socioeconomically challenged areas of the country where healthy and affordable foods may not be readily available and diet may not be a top priority for parents, it becomes a more challenging task to convince kids of the merits of eating healthfully and making lasting lifestyle changes. But it’s not impossible. TD: How can RDs and other nutrition professionals make a difference in schools in their communities? Katz: First, many dietitians are involved in counseling individuals, and that’s an important part of this. The only thing I would suggest is always ask about the family—always ask about the family. No man is an island. No woman is an island. And I fervently believe kids and parents will get healthier together or not at all. In addition, as clinicians, as people involved in the care of individual patients or clients, we all need to recognize that we’re a very small part of the solution because, frankly, much of the problem is environmental. And so, to the extent that your time, your finances, and your resources allow you to go beyond individual client counseling and get involved in program planning, take your message and your passion into the schools. Koch: I know I’d have a hard time knowing how to get involved if I didn’t work with schools as part of my job. So learning about the resources out there is important. A great way for RDs to get involved is to consider the initiative the Center for Science in the Public Interest is spearheading on October 24 called Food Day. They’re trying to get people all over the country to plan food-related and food awareness events on that day. This might be a good hook for RDs to use to get schools interested. St. Florian: They can volunteer to write curriculum. Curriculum writing is huge because the RD understands not only the science of nutrition but also how to teach it. That’s fundamental. You’ve got to have a good curriculum that takes into account your audience, whatever its age, and then determine who will go into the classroom and teach it. Plus, you have to advocate for funding from the government for these programs. TD: Is there anything you’d like to add? Koch: For nutrition education, the new MyPlate that came out is very positive. It lends itself to not only knowing what food goes into which category but also how to make the food look. So I believe MyPlate will help make nutrition education much clearer about which behaviors we want people to practice. All of the research has shown that to make nutrition education effective, we have to focus on motivating people to adopt the behaviors we want them to practice and then give them practical skills for how to do it.